It’s not easy to bathe a wet and slippery baby with “only” two hands. Are you searching for something that will make bath time safe, fun, and relaxing for babies, moms, and dads? A baby bath tub is a great solution. Baby bath tub is a great help for every new mom. Choice one to make your little one comfortable and your life easier. 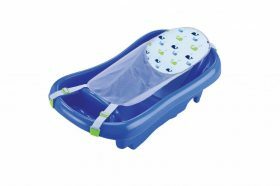 Make baby’s bath time a fun and relaxing experience with The First Year’s Infant To Toddler Tub with Sling. 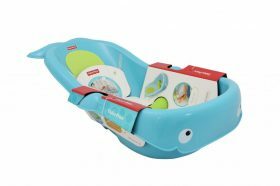 Offering the security, comfort and convenience that growing babies and parents need in the tub, this infant to toddler tub with sling won’t let you and your baby down. It comes with adjustable sizing that fits both single and double sinks. There is also a built-in wash basin to hold toys, supplies, and rinse water. For added safety, it also features drain plug alert for notification of water that is too hot. Now bathing time is an easy and enjoyable thing with the help of the Fisher-Price 4-in-1 Sling N Seat Tub. This tub features four stage convertible bath center with squeeze bottle and whale scoop for gentle rinsing or play. It also features “Sit-Me-Up Support” to aid unsteady sitters in the tub. The hook makes it easy to dry and allows for space-saving storage. You will love the fact that this tub will meet your baby’s changing needs at every stage, from newborn, to infant to toddler. Looking for a bath tub that is ideal for both infant and toddler use? The Fisher-Price Precious Planet Whale of a Tub is an great choice. This adaptable tub with fun whale design will provide a relaxing bath experience. It fits over double sinks or inside traditional bath tubs. 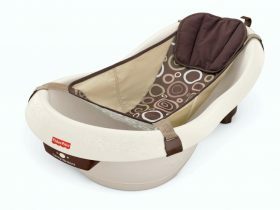 It features soft-grip, non-slip foam surface to keep your baby in place and comfortable. This adorable bath center grows from infant to toddler. Baby’s bath time has never been easier and more comfortable than with the Fisher-Price Calming Waters Vibration Bathing Tub. This bathing tub comes equipped with three “grow-with-me” stages, each with optional calming vibrations, to help soothe baby. The secure fabric sling with padded headrest gives little ones a sense of security. Thanks to the adjustable and removable sling, this tub grows with baby. Also comes with a convenient hook for drying and storage. Convenient, safety and comfortable, the Summer Infant Newborn-to-Toddler Bath and Shower Tub will make you and your baby happy. 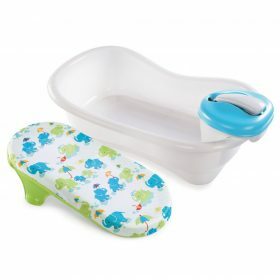 This newborn-to-toddler bath center and shower is the only tub parents will need from infancy through toddler ages. 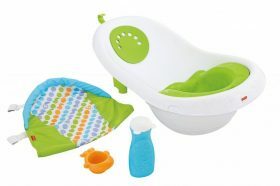 It features four stages to grow with child, making bath time easier and more convenient for both parent and baby. The removable shower unit for extended use.